The Seven Sorrows of Our Lady, and the Eight Footnotes to a Short, Weekday Homily. The Memorial of Our Lady of Sorrows. • Psalm 31: 2-6, 15-16, 20. • John 19: 25-27 (or Luke 2: 33-35). • I Corinthians 15: 1-11. • Psalm 118: 1-2, 16-17, 28. …the sequence remaining optional and the third lesson from the proper as above being required. • Ephesians 5: 33—6: 9. 10:03 AM 9/15/2016 — Today's memorial, Our Lady of Sorrows, used to be—and still is in the extraordinary form of the Roman Rite—the Second Class Feast of the Seven Sorrows of the Blessed Virgin Mary. I'm not altogether sure how the commemoration is improved by making it non-specific, as devotion to the Seven Sorrows has a long history in the Church. While the feast wasn't placed on the Church's universal calendar until 1814 by Pope Pius VII, it was already being celebrated locally in many places for a long time as a liturgical outpouring of what was already a very popular devotion on the part of the faithful. The Seven Sorrows—or Dolors—of our Lady are all taken from Holy Scripture: the prophecy of Simeon from Luke 2, the flight into Egypt from Matthew 2, the loss of the Child Jesus in the temple from Luke 3, the meeting of Jesus and Mary on the Way of the Cross, the crucifixion, the taking down of the Body of Jesus from the Cross, and the burial of our Lord. The good Saint Bridget, who spread this devotion, informs us that there are also seven graces the Mother of God promises to those who meditate on Her Seven Sorrows: peace in their family life, understanding of Divine mysteries, consolation in their sufferings, easier abandonment to the holy Will of God, defense against the assaults of the Devil, help at the moment of death, and a special advocacy when standing before the throne of judgment. * On this memorial, the third lesson from the proper, for which there are two options, is always required, with the first and second lessons taken from either the proper or the secondary feria as indicated. In either case, the Sequence remains optional (in the extraordinary form, the Sequence is required). No lessons from any common are indicated. 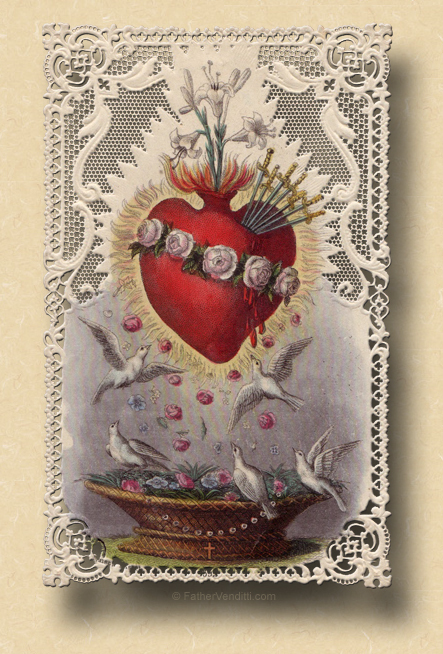 *** In the extraordinary form of the Roman Rite, the Seven Sorrows of Mary are commemorated liturgically twice: once on the Friday of Passion Week, and once today. The Masses on both days are practically identical, except for the addition of the Sequence today. St. Nicomedes, a priest of Rome, was scourged to death under Domitian in the first century. If a High Mass is offered for the Seven Sorrows, the commemoration of St. Nicomedes is not made, and a second Low Mass for the saint might be offered for a serious reason; if, however, a Low Mass is offered for the feast, the commemoration of the saint is made by an additional Collect, Secret and Postcommunion added to those of the feast, and a Mass just for the saint is not permitted. Cf. the footnote ††† below. † The Gradual is non-Scriptural: "Thou art full of sorrow and of tears, O Virgin Mary, standing near the cross of the Lord Jesus, Thy Son, the Redeemer. O Virgin Mother of God, He whom the whole world doth not contain, beareth this torment of the cross, the Author of life made man." 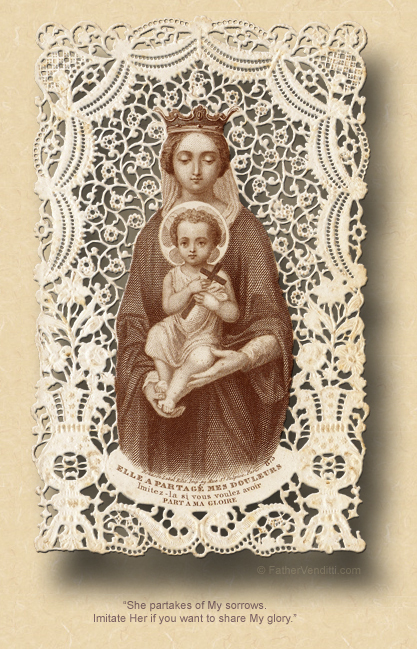 †† The Tract is non-Scriptural: "Holy Mary, the Queen of heaven and Mistress of the world, stood by the cross of our Lord Jesus, full of sorrows. 'O all ye that pass by the way, attend, and see if there be any sorrow like to my sorrow' (Lam. 1: 12)." ††† Ordinarily, a Mass solely for a commemoration coinciding with a second class feast would not be permitted; however, such a Mass might possibly be offered as indicated for a serious reason, such as if the parish is named for the saint, but it would have to be a Low Mass and could not be the only Mass of the day, with the presumption that the Mass for the second class feast is a High Mass in which the usual commemoration is not made as described in footnote *** above. The ordinary form, for the most part, solves this difficulty by allowing a memorial honoring the patron of the parish to be promoted to the rank of a solemnity in that parish only, but such promotions do not occur in the extraordinary form. For a thorough treatment of how commemorations are handled in the extraordinary form, cf. the post here. ‡ Nicetas was born and educated in the country of the Goths near the River Danube. After his martyrdom, his body was transferred to Mopsuestia in Asia Minor, then to Venice. Symeon was archbishop of Thessalonica from 1416 or 1417, until his death in 1429. ‡‡ This is my own translation, based on the Latin text. The translation of this prayer in the Roman Missal Third Edition is confusing, and seems to indicate, by the way the clauses are ordered, that there is something lacking in the sufferings of Christ.